Asphalt has been used for a variety of purposes for at least 2,500 years, but it was during the 18th century that it began to see widespread use as a paving material. The lifespan of asphalt pavement depends on a number of factors. The most critical element in extending the life of asphalt pavement is proper maintenance and upkeep. Properly maintained asphalt pavement should last between 20 and 30 years, or 25 years on average. Climate plays an important part in the premature failing of asphalt pavement. In dry, hot areas, the pavement may become brittle. In humid, wet areas, moisture can accumulate beneath the pavement and weaken it. Water beneath the pavement, which can occur from leaking pipes or a rising water table, can weaken the pavement so much that it can no longer support traffic. Improper drainage of surface water, such as from heavy rains or runoff, can also cause the pavement to fail. Whether it is on the surface or below the pavement, water can freeze, expanding any cracks and contributing to premature failure. However, the most common reason for having to replace asphalt pavement prematurely is neglect. Filling and sealing cracks as they appear protects the pavement structure and base from water accumulating under the pavement. Repairing areas that are showing signs of fatigue prior to their failure can prevent more costly repairs later. Filling potholes while they are still small is another way of avoiding more expensive fixes. One of the best methods of protecting asphalt pavement is with asphalt sealcoating. Two coats are normally applied to protect asphalt from the damage that the sun, salt, oil, gas and water can cause. In addition, sealcoating gives the asphalt a deep, black finish that enhances its appearance. Learn more about our asphalt sealcoating service. Asphalt rejuvenator enhances the look of pavement while protecting the asphalt. Rejuvenator replenishes the oils found in asphalt. As a result, the asphalt is more resilient and less prone to cracking. One application can last for three to five years, and in some instances, the pavement can last twice as long. Contact Asphalt Pavement Solutions at 800-559-SEAL or fill out the Free Job Quote form to get started. 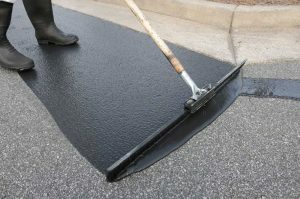 We specialize in asphalt sealcoating in Philadelphia, throughout Pennsylvania, New Jersey, and Delaware!